Following the widespread critical and commercial success of 2003's Dub Side of the Moon and 2006's Radiodread, Easy Star Records announces the Easy Star All-Stars' complete reggae re-imagining of the Beatles' Sgt. Pepper's Lonely Hearts Club Band. 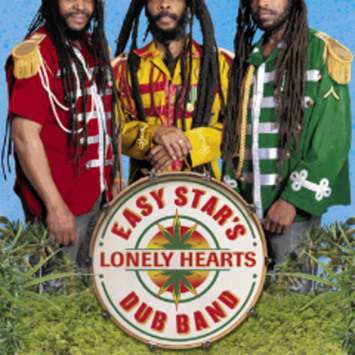 The album, titled Easy Star's Lonely Hearts Dub Band, is set for release April 14 on Easy Star Records and features guest vocals from an impressive list of reggae, dancehall and dub greats including Steel Pulse, Matisyahu, Michael Rose (Black Uhuru), Luciano, U Roy, Bunny Rugs (Third World), Ranking Roger (English Beat), Sugar Minott, Frankie Paul, Max Romeo and The Mighty Diamonds. The first single, "With A Little Help From My Friends," featuring Luciano, will be released as an iTunes exclusive February 10. It will be paired with a b-side dub version featuring the legendary U Roy. Dub Side of the Moon, (Easy Star's reggae tribute to Pink Floyd's Dark Side of the Moon) is one of the most successful reggae albums of the 21st century and spent over five years on Billboard's Top Reggae Chart. Mojo selected the record as the second greatest cover album of all time. Radiodread, which tackled Radiohead's OK Computer, spent over 18 months on Billboard's Top Reggae Chart and earned praise from Radiohead themselves. Of the decision to infuse reggae into the Beatles classic, producer Michael Goldwasser says "We've focused on re-envisioning concept albums as reggae and it's really important that the source material works as a whole and is not just a collection of songs. So, what better to take on next than the mother of all concept albums?" Goldwasser is once more the musical mastermind behind this album, having arranged and produced the music, assembled the musicians and guest artists and played guitar throughout. Goldwasser is joined by Victor Rice (bass), Victor "Ticklah" Axelrod (keyboards) and Patrick Dougher & Eddie Ocampo (drums, percussion). Members of the touring version of the Easy Star All-Stars also contribute, including Ras I Ray, Jenny Hill, Buford O'Sullivan, Ivan Katz, Kirsty Rock, Tamar-kali, Junior Jazz and Menny More. In addition to producing six albums for Easy Star, Goldwasser has produced albums for Corey Harris, Hatikva 6 and others, and has had compositions featured in the motion pictures Failure To Launch and Woody Allen's Cassandra's Dream.